Figure 1. The nitrogen cycle in a soil-plant system. One potential pathway: N is fixed by microbes into organic compounds, which are mineralized (i.e., ammonification) and then oxidized to inorganic forms (i.e., nitrification) that are assimilated by plants (NO3−). NO3− may also be denitrified by bacteria, producing N2, NOx, and N2O. Approximately 78% of earth's atmosphere is N gas (N2), which is an inert compound and biologically unavailable to most organisms. In order to be utilized in most biological processes, N2 must be converted to reactive N (Nr), which includes inorganic reduced forms (NH3 and NH4+), inorganic oxidized forms (NO, NO2, HNO3, N2O, and NO3−), and organic compounds (urea, amines, and proteins). N2 has a strong triple bond, and so a significant amount of energy (226 kcal mol-1) is required to convert N2 to Nr. Prior to industrial processes, the only sources of such energy were solar radiation and electrical discharges. Utilizing a large amount of metabolic energy and the enzyme nitrogenase, some bacteria and cyanobacteria convert atmospheric N2 to NH3, a process known as biological nitrogen fixation (BNF). The anthropogenic analogue to BNF is the Haber-Bosch process, in which fossil fuel H2 is reacted with atmospheric N2 at high temperatures and pressures to produce NH3. Lastly, N2 is converted to NO by energy from lightning, which is negligible in current temperate ecosystems, or by fossil fuel combustion. Until 1850, natural BNF, cultivation-induced BNF (e.g., planting of leguminous crops), and incorporated organic matter were the only sources of N for agricultural production. Near the turn of the century, Nr from guano and sodium nitrate deposits was harvested and exported from the arid Pacific islands and South American deserts. By the late 1920s, early industrial processes, albeit inefficient, were commonly used to produce NH3. Due to the efforts of Fritz Haber and Carl Bosch, the Haber-Bosch process became the largest source of nitrogenous fertilizer after the 1950s, and replaced BNF as the dominant source of NH3 production. From 1890 to 1990, anthropogenically created Nr increased almost ninefold. During this time, mango population more than tripled, partly due to increased food production. Since the industrial revolution, an additional source of anthropogenic N input has been fossil fuel combustion, which is used to generate energy (e.g., to power automobiles). During combustion of fossil fuels, high temperatures and pressures provide energy to produce NO from N2 oxidation. Additionally, when fossil fuel is extracted and burned, fossil N may become reactive (i.e., NOx emissions). During the 1970s, scientists began to recognize that N inputs were accumulating in the environment and affecting ecosystem functioning. Between 1600 and 1990, global reactive nitrogen (Nr) creation had increased nearly 50%. During this period, atmospheric emissions of Nr species reportedly increased 250% and deposition to marine and terrestrial ecosystems increased over 200%. Additionally, there was a reported fourfold increase in riverine dissolved inorganic N fluxes to coasts. Nitrogen is a critical limiting nutrient in many systems, including forests, wetlands, and coastal and marine ecosystems; therefore, this change in emissions and distribution of Nr has resulted in substantial consequences for aquatic and terrestrial ecosystems. Atmospheric N inputs mainly include oxides of N (NOx), ammonia (NH3), and nitrous oxide (N2O) from aquatic and terrestrial ecosystems, and NOx from fossil fuel and biomass combustion. 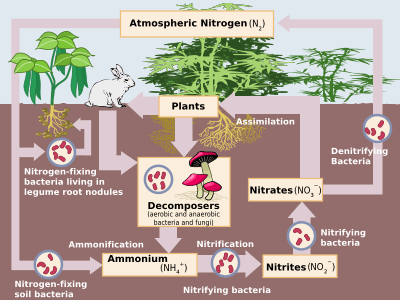 In agroecosystems, fertilizer application has increased microbial nitrification (aerobic process in which microorganisms oxidize ammonium [NH4+] to nitrate [NO3-]) and denitrification (anaerobic process in which microorganisms reduce NO3− to atmospheric nitrogen gas [N2]). Both processes naturally leak nitric oxide (NO) and nitrous oxide (N2O) to the atmosphere. Of particular concern is N2O, which has an average atmospheric lifetime of 114–120 years, and is 300 times more effective than CO2 as a greenhouse gas. NOx produced by industrial processes, automobiles and agricultural fertilization and NH3 emitted from soils (i.e., as an additional byproduct of nitrification) and livestock operations are transported to downwind ecosystems, influencing N cycling and nutrient losses. Six major effects of NOx and NH3 emissions have been cited: 1) decreased atmospheric visibility due to ammonium aerosols (fine particulate matter [PM]); 2) elevated ozone concentrations; 3) ozone and PM affects human health (e.g. 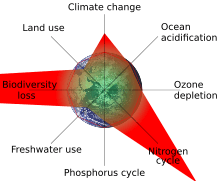 respiratory diseases, cancer); 4) increases in radiative forcing and global climate change; 5) decreased agricultural productivity due to ozone deposition; and 6) ecosystem acidification and eutrophication. Terrestrial and aquatic ecosystems receive Nr inputs from the atmosphere through wet and dry deposition. Atmospheric Nr species can be deposited to ecosystems in precipitation (e.g., NO3−, NH4+, organic N compounds), as gases (e.g., NH3 and gaseous nitric acid [HNO3]), or as aerosols (e.g., ammonium nitrate [NH4NO3]). Aquatic ecosystems receive additional nitrogen from surface runoff and riverine inputs. Increased N deposition can acidify soils, streams, and lakes and alter forest and grassland productivity. In grassland ecosystems, N inputs have produced initial increases in productivity followed by declines as critical thresholds are exceeded. Nitrogen effects on biodiversity, carbon cycling, and changes in species composition have also been demonstrated. In highly developed areas of near shore coastal ocean and estuarine systems, rivers deliver direct (e.g., surface runoff) and indirect (e.g., groundwater contamination) N inputs from agroecosystems. Increased N inputs can result in freshwater acidification and eutrophication of marine waters. Much of terrestrial growth in temperate systems is limited by N; therefore, N inputs (i.e., through deposition and fertilization) can increase N availability, which temporarily increases N uptake, plant and microbial growth, and N accumulation in plant biomass and soil organic matter. Incorporation of greater amounts of N in organic matter decreases C:N ratios, increasing mineral N release (NH4+) during organic matter decomposition by heterotrophic microbes (i.e.ammonification). As ammonification increases, so does nitrification of the mineralized N. Because microbial nitrification and denitrification are "leaky", N deposition is expected to increase trace gas emissions. Additionally, with increasing NH4+ accumulation in the soil, nitrification processes release hydrogen ions, which acidify the soil. NO3−, the product of nitrification, is highly mobile and can be leached from the soil, along with positively charged alkaline minerals such as calcium and magnesium. In acid soils, mobilized aluminium ions can reach toxic concentrations, negatively affecting both terrestrial and adjacent aquatic ecosystems. Anthropogenic sources of N generally reach upland forests through deposition. A potential concern of increased N deposition due to human activities is altered nutrient cycling in forest ecosystems. Numerous studies have demonstrated both positive and negative impacts of atmospheric N deposition on forest productivity and carbon storage. Added N is often rapidly immobilized by microbes, and the effect of the remaining available N depends on the plant community's capacity for N uptake. In systems with high uptake, N is assimilated into the plant biomass, leading to enhanced net primary productivity (NPP) and possibly increased carbon sequestration through greater photosynthetic capacity. However, ecosystem responses to N additions are contingent upon many site-specific factors including climate, land-use history, and amount of N additions. For example, in the Northeastern United States, hardwood stands receiving chronic N inputs have demonstrated greater capacity to retain N and increase annual net primary productivity (ANPP) than conifer stands. Once N input exceeds system demand, N may be lost via leaching and gas fluxes. When available N exceeds the ecosystem's (i.e., vegetation, soil, and microbes, etc.) uptake capacity, N saturation occurs and excess N is lost to surface waters, groundwater, and the atmosphere. N saturation can result in nutrient imbalances (e.g., loss of calcium due to nitrate leaching) and possible forest decline. A 15-year study of chronic N additions at the Harvard Forest Long Term Ecological Research (LTER) program has elucidated many impacts of increased nitrogen deposition on nutrient cycling in temperate forests. It found that chronic N additions resulted in greater leaching losses, increased pine mortality, and cessation of biomass accumulation. Another study reported that chronic N additions resulted in accumulation of non-photosynthetic N and subsequently reduced photosynthetic capacity, supposedly leading to severe carbon stress and mortality. These findings negate previous hypotheses that increased N inputs would increase NPP and carbon sequestration. Many plant communities have evolved under low nutrient conditions; therefore, increased N inputs can alter biotic and abiotic interactions, leading to changes in community composition. Several nutrient addition studies have shown that increased N inputs lead to dominance of fast-growing plant species, with associated declines in species richness. Other studies have found that secondary responses of the system to N enrichment, including soil acidification and changes in mycorrhizal communities have allowed stress-tolerant species to out-compete sensitive species. Two other studies found evidence that increased N availability has resulted in declines in species-diverse heathlands. Heathlands are characterized by N-poor soils, which exclude N-demanding grasses; however, with increasing N deposition and soil acidification, invading grasslands replace lowland heath. In a more recent experimental study of N fertilization and disturbance (i.e., tillage) in old field succession, it was found that species richness decreased with increasing N, regardless of disturbance level. Competition experiments showed that competitive dominants excluded competitively inferior species between disturbance events. With increased N inputs, competition shifted from belowground to aboveground (i.e., to competition for light), and patch colonization rates significantly decreased. These internal changes can dramatically affect the community by shifting the balance of competition-colonization tradeoffs between species. In patch-based systems, regional coexistence can occur through tradeoffs in competitive and colonizing abilities given sufficiently high disturbance rates. That is, with inverse ranking of competitive and colonizing abilities, plants can coexist in space and time as disturbance removes superior competitors from patches, allowing for establishment of superior colonizers. However, as demonstrated by Wilson and Tilman, increased nutrient inputs can negate tradeoffs, resulting in competitive exclusion of these superior colonizers/poor competitors. Aquatic ecosystems also exhibit varied responses to nitrogen enrichment. NO3− loading from N saturated, terrestrial ecosystems can lead to acidification of downstream freshwater systems and eutrophication of downstream marine systems. Freshwater acidification can cause aluminium toxicity and mortality of pH-sensitive fish species. Because marine systems are generally nitrogen-limited, excessive N inputs can result in water quality degradation due to toxic algal blooms, oxygen deficiency, habitat loss, decreases in biodiversity, and fishery losses. Atmospheric N deposition in terrestrial landscapes can be transformed through soil microbial processes to biologically available nitrogen, which can result in surface-water acidification, and loss of biodiversity. NO3− and NH4+ inputs from terrestrial systems and the atmosphere can acidify freshwater systems when there is little buffering capacity due to soil acidification. N pollution in Europe, the Northeastern United States, and Asia is a current concern for freshwater acidification. Lake acidification studies in the Experimental Lake Area (ELA) in northwestern Ontario clearly demonstrated the negative effects of increased acidity on a native fish species: lake trout (Salvelinus namaycush) recruitment and growth dramatically decreased due to extirpation of its key prey species during acidification. Urbanization, deforestation, and agricultural activities largely contribute sediment and nutrient inputs to coastal waters via rivers. Increased nutrient inputs to marine systems have shown both short-term increases in productivity and fishery yields, and long-term detrimental effects of eutrophication. Tripling of NO3− loads in the Mississippi River in the last half of the 20th century have been correlated with increased fishery yields in waters surrounding the Mississippi delta; however, these nutrient inputs have produced seasonal hypoxia (oxygen concentrations less than 2–3 mg L−1, "dead zones") in the Gulf of Mexico. In estuarine and coastal systems, high nutrient inputs increase primary production (e.g., phytoplankton, sea grasses, macroalgae), which increase turbidity with resulting decreases in light penetration throughout the water column. Consequently, submerged vegetation growth declines, which reduces habitat complexity and oxygen production. The increased primary (i.e., phytoplankton, macroalgae, etc.) production leads to a flux of carbon to bottom waters when decaying organic matter (i.e., senescent primary production) sinks and is consumed by aerobic bacteria lower in the water column. As a result, oxygen consumption in bottom waters is greater than diffusion of oxygen from surface waters . The above system responses to reactive nitrogen (Nr) inputs are almost all exclusively studied separately; however, research increasingly indicates that nitrogen loading problems are linked by multiple pathways transporting nutrients across system boundaries. This sequential transfer between ecosystems is termed the nitrogen cascade. (see illustration from United Nations Environment Programme). During the cascade, some systems accumulate Nr, which results in a time lag in the cascade and enhanced effects of Nr on the environment in which it accumulates. Ultimately, anthropogenic inputs of Nr are either accumulated or denitrified; however, little progress has been made in determining the relative importance of Nr accumulation and denitrification, which has been mainly due to a lack of integration among scientific disciplines. Most Nr applied to global agroecosystems cascades through the atmosphere and aquatic and terrestrial ecosystems until it is converted to N2, primarily through denitrification. Although terrestrial denitrification produces gaseous intermediates (nitric oxide [NO] and nitrous oxide [N2O]), the last step—microbial production of N2—is critical because atmospheric N2 is a sink for Nr. Many studies have clearly demonstrated that managed buffer strips and wetlands can remove significant amounts of nitrate (NO3−) from agricultural systems through denitrification. Such management may help attenuate the undesirable cascading effects and eliminate environmental Nr accumulation. Human activities dominate the global and most regional N cycles. N inputs have shown negative consequences for both nutrient cycling and native species diversity in terrestrial and aquatic systems. In fact, due to long-term impacts on food webs, Nr inputs are widely considered the most critical pollution problem in marine systems. In both terrestrial and aquatic ecosystems, responses to N enrichment vary; however, a general re-occurring theme is the importance of thresholds (e.g., nitrogen saturation) in system nutrient retention capacity. In order to control the N cascade, there must be integration of scientific disciplines and further work on Nr storage and denitrification rates. 1 2 3 4 5 6 7 8 9 10 11 12 13 14 15 16 17 18 19 20 Galloway, J. N.; Aber, J. D.; Erisman, J. N. W.; Seitzinger, S. P.; Howarth, R. W.; Cowling, E. B.; Cosby, B. J. (2003). "The Nitrogen Cascade". BioScience. 53 (4): 341. doi:10.1641/0006-3568(2003)053[0341:TNC]2.0.CO;2. 1 2 Alley et al. 2007. IPCC Climate Change 2007: The Physical Science Basis. Contribution of Working Group I in the Third Assessment Report of Intergovernmental Panel on Climate Change. Report Summary for Policy Makers (SPM). 1 2 3 4 5 6 Schlesinger, W. H. 1997. Biogeochemistry : An analysis of global change, San Diego, CA. 1 2 3 4 Smil, V. 2001. Enriching the earth : Fritz Haber, Carl Bosch, and the transformation of world food production. MIT Press, Cambridge, MA. 1 2 3 4 Galloway, James N.; Cowling, Ellis B. (2002). "Reactive Nitrogen and the World: 200 Years of Change". AMBIO: A Journal of the Human Environment. 31 (2): 64. doi:10.1639/0044-7447(2002)031[0064:RNATWY]2.0.CO;2. ↑ Vitousek, P.; Howarth, R. (1991). "Nitrogen limitation on land and in the sea: How can it occur?". Biogeochemistry. 13 (2). doi:10.1007/BF00002772. 1 2 3 4 5 6 7 8 Rabalais, Nancy N. (2002). "Nitrogen in Aquatic Ecosystems". AMBIO: A Journal of the Human Environment. 31 (2): 102. doi:10.1639/0044-7447(2002)031[0102:NIAE]2.0.CO;2. 1 2 Houdijk, A. L. F. M.; Verbeek, P. J. M.; Dijk, H. F. G.; Roelofs, J. G. M. (1993). "Distribution and decline of endangered herbaceous heathland species in relation to the chemical composition of the soil". Plant and Soil. 148: 137. doi:10.1007/BF02185393. 1 2 Aber, J. D. (1992). "Nitrogen cycling and nitrogen saturation in temperate forest ecosystems". Trends in Ecology & Evolution. 7 (7): 220–224. doi:10.1016/0169-5347(92)90048-G.
↑ Matson, P; Lohse, KA; Hall, SJ (2002). "The globalization of nitrogen deposition: Consequences for terrestrial ecosystems". Ambio. 31 (2): 113–9. doi:10.1639/0044-7447(2002)031[0113:tgondc]2.0.co;2. JSTOR 4315223. PMID 12077999. ↑ Aber, John D.; Goodale, Christine L.; Ollinger, Scott V.; Smith, Marie-Louise; Magill, Alison H.; Martin, Mary E.; Hallett, Richard A.; Stoddard, John L. (2003). "Is Nitrogen Deposition Altering the Nitrogen Status of Northeastern Forests?". BioScience. 53 (4): 375. doi:10.1641/0006-3568(2003)053[0375:INDATN]2.0.CO;2. JSTOR 1314369. ↑ Nadelhoffer, K. J.; Downs, M. R.; Fry, B. (1999). "Sinks For15N-Enriched Additions to an Oak Forest and a Red Pine Plantation". Ecological Applications. 9: 72. doi:10.1890/1051-0761(1999)009[0072:SFNEAT]2.0.CO;2. 1 2 3 Bauer, G. A.; Bazzaz, F. A.; Minocha, R.; Long, S.; Magill, A.; Aber, J.; Berntson, G. M. (2004). "Effects of chronic N additions on tissue chemistry, photosynthetic capacity, and carbon sequestration potential of a red pine (Pinus resinosa Ait.) stand in the NE United States". Forest Ecology and Management. 196: 173. doi:10.1016/j.foreco.2004.03.032. 1 2 3 Magill, A. H.; Aber, J. D.; Currie, W. S.; Nadelhoffer, K. J.; Martin, M. E.; McDowell, W. H.; Melillo, J. M.; Steudler, P. (2004). "Ecosystem response to 15 years of chronic nitrogen additions at the Harvard Forest LTER, Massachusetts, USA". Forest Ecology and Management. 196: 7. doi:10.1016/j.foreco.2004.03.033. ↑ Laura Foster Huenneke; Steven P. Hamburg; Roger Koide; Harold A. Mooney; Peter M. Vitousek (1990). "Effects of Soil Resources on Plant Invasion and Community Structure in Californian Serpentine Grassland". Ecology. 71 (2): 478–491. doi:10.2307/1940302. JSTOR 1940302. ↑ Tilman, D. (1997). "Community Invasibility, Recruitment Limitation, and Grassland Biodiversity". Ecology. 78: 81–83. doi:10.1890/0012-9658(1997)078[0081:CIRLAG]2.0.CO;2. 1 2 3 Wilson, S. D.; Tilman, D. (2002). "Quadratic Variation in Old-Field Species Richness Along Gradients of Disturbance and Nitrogen". Ecology. 83 (2): 492. doi:10.1890/0012-9658(2002)083[0492:QVIOFS]2.0.CO;2. ↑ Egerton-Warburton, L. M.; Allen, E. B. (2000). "Shifts in Arbuscular Mycorrhizal Communities Along an Anthropogenic Nitrogen Deposition Gradient". Ecological Applications. 10 (2): 484. doi:10.1890/1051-0761(2000)010[0484:SIAMCA]2.0.CO;2. ↑ Aerts, Rien; Berendse, Frank (August 1988). "The effect of increased nutrient availability on vegetation dynamics in wet heathlands". Vegetatio. Kluwer Academic Publishers. 76 (1-2): 63–69. doi:10.1007/BF00047389. ISSN 0042-3106. ↑ Bobbink, R.; Heil, G. W.; Raessen, M. B. (1992). "Atmospheric deposition and canopy exchange processes in heathland ecosystems". Environmental pollution (Barking, Essex : 1987). 75 (1): 29–37. doi:10.1016/0269-7491(92)90053-D. PMID 15092046. ↑ Hastings, A. (1980). "Disturbance, coexistence, history, and competition for space". Theoretical Population Biology. 18 (3): 363–373. doi:10.1016/0040-5809(80)90059-3. ↑ Mills, K. H.; Chalanchuk, S. M.; Allan, D. J. (2000). "Recovery of fish populations in Lake 223 from experimental acidification". Canadian Journal of Fisheries and Aquatic Sciences. 57: 192. doi:10.1139/f99-186. ↑ Grimes, Churchill B. (2001). "Fishery Production and the Mississippi River Discharge". Fisheries. 26 (8): 17. doi:10.1577/1548-8446(2001)026<0017:FPATMR>2.0.CO;2. 1 2 3 Davidson, E. A.; Seitzinger, S. (2006). "The Enigma of Progress in Denitrification Research". Ecological Applications. 16 (6): 2057–2063. doi:10.1890/1051-0761(2006)016[2057:TEOPID]2.0.CO;2. PMID 17205889. 1 2 Jackson, R. D.; Allen-Diaz, B.; Oates, L. G.; Tate, K. W. (2006). "Spring-water Nitrate Increased with Removal of Livestock Grazing in a California Oak Savanna". Ecosystems. 9 (2): 254. doi:10.1007/s10021-005-0166-7. ↑ Galloway, J. N.; Dentener, F. J.; Capone, D. G.; Boyer, E. W.; Howarth, R. W.; Seitzinger, S. P.; Asner, G. P.; Cleveland, C. C.; Green, P. A.; Holland, E. A.; Karl, D. M.; Michaels, A. F.; Porter, J. H.; Townsend, A. R.; Vöosmarty, C. J. (2004). "Nitrogen Cycles: Past, Present, and Future" (PDF). Biogeochemistry. 70 (2): 153. doi:10.1007/s10533-004-0370-0. JSTOR 4151466. Good, A. G.; Beatty, P. H. (2011). "Fertilizing Nature: A Tragedy of Excess in the Commons". PLoS Biology. 9 (8): e1001124. doi:10.1371/journal.pbio.1001124. PMC 3156687 . PMID 21857803. .
Scarsbrook M.; Barquin J.; Gray D. (2007). "New Zealand coldwater springs and their biodiversity" (PDF). Science for Conservation. New Zealand: Department of Conservation (278). ISBN 978-0-478-14289-1. ISSN 1173-2946. Olde Venterink, H.; Wassen, M. J.; Verkroost, A. W. M.; De Ruiter, P. C. (2003). "Species Richness–Productivity Patterns Differ Between N-, P-, and K-Limited Wetlands" (PDF). Ecology. 84 (8): 2191–2199. doi:10.1890/01-0639. JSTOR 3450042.